Great apps are even better when they’re on sale! We’ve selected 22 iPhone and iPad apps that are at over 50% off. 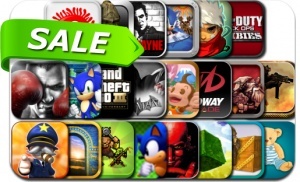 This app deal alert includes Le Havre, Carmageddon, Dream of Pixels, Sonic CD, Jelly Defense, The Infinity Project 2, Max Payne Mobile, Neuroshima Hex Puzzle, Neuroshima Hex, Great Big War Game, Bastion and many others.